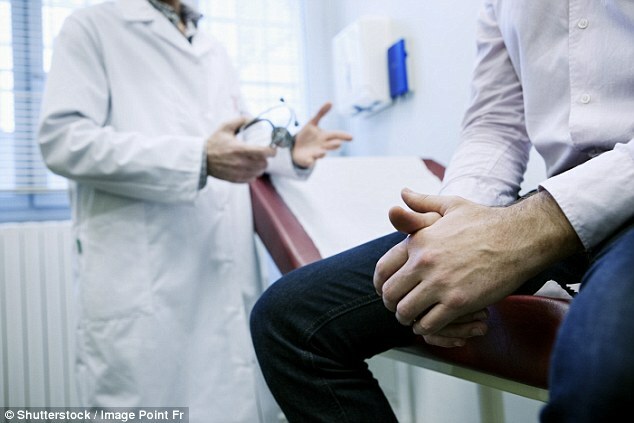 Tens of thousands of men could benefit from a breakthrough prostate treatment announced today. The technique uses tiny plastic beads to block the blood supply and shrink the enlarged gland – all without an operation. A successful trial in Portugal is being followed up in Britain, with results due back later this year. If successful it could be rolled out for routine use on the NHS. Half of all men over 50 suffer from an enlarged prostate and every year 45,000 have risky surgery to remove part of it. As well as being painful and invasive, the operation can cause loss of sexual function and even incontinence. Last night, researchers said they expected the new technique – prostate artery embolisation – to largely replace surgery as the standard treatment. An enlarged prostate presses on the bladder, while also blocking the urethra. This means sufferers need to make repeated night-time trips to the toilet, often to find they cannot urinate at all. This can lead to a build-up of toxins that cause severe kidney problems. The bead technique has been tested on 1,000 middle-aged men in Portugal. Joao Martins Pisco, who led the study at St Louis Hospital in Lisbon, said: ‘Within five years I think this will replace surgery as the standard treatment. ‘Prostate artery embolisation gives men a treatment option that is less invasive than other therapies and allows them to return to their normal lives sooner. Time and time again, I see patients who are relieved to find out about prostate artery embolisation because they are not able to tolerate medications due to their side effects. 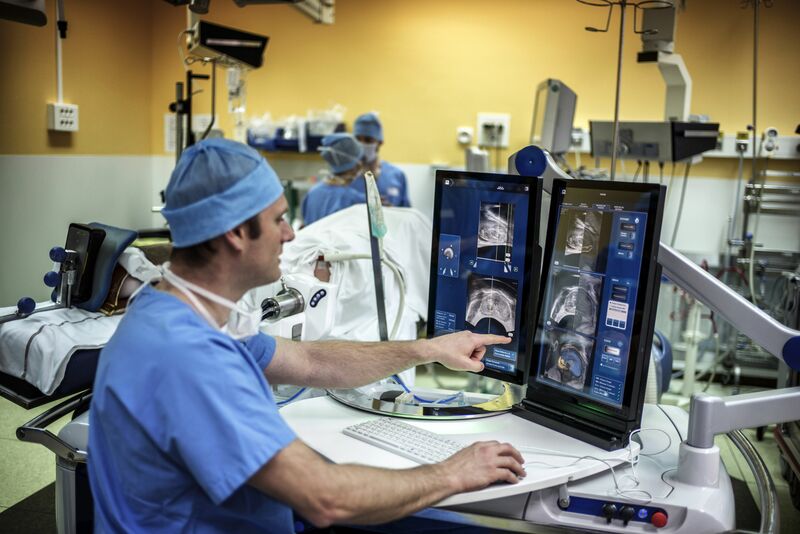 The Portuguese team, which will present its findings at the Society of Interventional Radiology in Washington DC today, concluded the procedure is as effective as surgery and the benefits may last as long. Only two patients in the seven-year trial had clinical side effects. Performed under local anaesthetic, the procedure involves injecting hundreds of 0.2mm plastic beads into an artery in the groin. 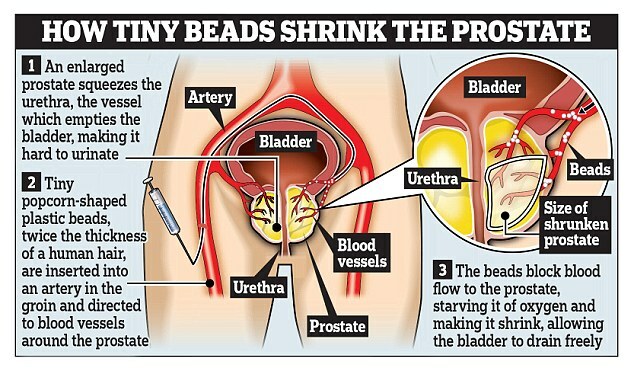 The beads are directed with a thin tube into the blood vessels that flow to the prostate, blocking blood supply to the enlarged gland so that it shrinks. His team saw a 89 per cent success rate six months after surgery, 82 per cent success up to three years, and 78 per cent beyond three years. 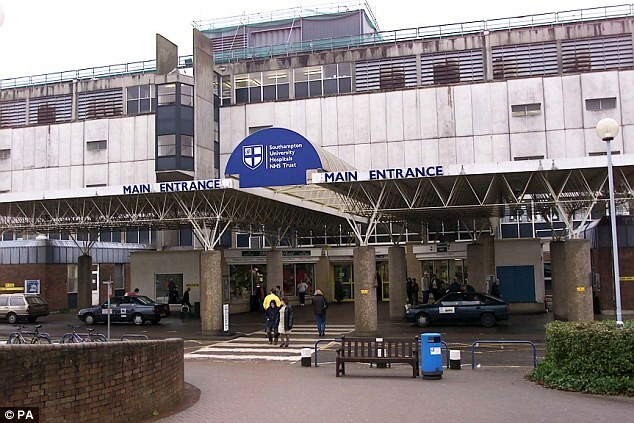 Two hundred patients in Southampton General, Guy’s Hospital in London and 16 other clinics are involved in the British trial, which is part-funded by the clinical watchdog NICE. Louise de Winter of the Urology Foundation said: ‘This research is very exciting. An estimated 45,000 men undergo surgery for enlarged prostates every year in the UK. Dr Pisco claims most of these could be replaced by prostate artery embolisation – although others say the less invasive procedure is not be suitable for all men, and many will have to continue to have surgery. Dr Hacking said that in his own experience, roughly 40 per cent of patients who have embolisation later have to undergo operations. But having initial embolisation may enable them to delay that operation while retaining sexual function, and this usually means that when they do come to have an operation it is less invasive and there is a lower risk of side effects. ‘Even if they do need to go back and have surgery it’s a smaller operation,’ he said. Dr Hacking said it was unlikely the procedure will completely replace surgery, because it requires a highly trained interventional radiologist. ‘It is a fiddly procedure and it would be potentially dangerous for someone without the skills to do it,’ he said. Surgery, conducted either with a hot wire or lasers, have a high success rate – but they come with side effects which can include loss of sexual function, bleeding and incontinence. The symptoms of enlarged prostate include a frequent need to urinate, but also difficulty starting to urinate and difficulty fully emptying a bladder. These symptoms, however, also might be a sign of prostate cancer, so anyone in this way should be seen by a urologist. Doctors have welcomed an “exciting” technique that could spare tens of thousands of men surgery for an uncomfortable prostate problem. 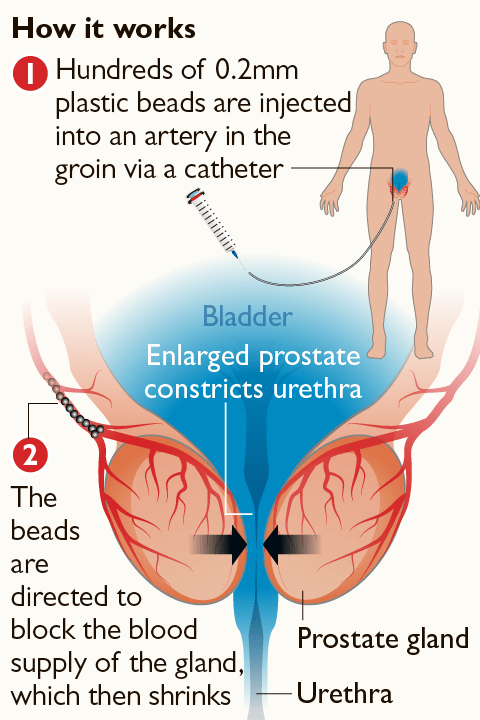 The NHS treatments adviser is studying closely a procedure that injects tiny plastic beads into arteries to block blood flow to the prostate after research found it safe and effective. About half of older men have an enlarged prostate. Although it is not a serious health threat, sufferers have problems urinating and their nights are disrupted by frequent lavatory visits. Medication is often used and an estimated 45,000 men a year are offered surgery to cut away part of the prostate and relieve the pressure of the gland against the urethra. This requires at least a night in hospital. It also often requires several weeks of recuperation and carries the risk of complications. Now a trial of 1,000 men has found that the less invasive method of starving the prostate appears to be as good as surgery. Success rates were 89 per cent after six months, 82 per cent after more than a year and 78 per cent after more than three years, researchers told the Society of Interventional Radiology in Washington yesterday. Only two patients suffered side-effects such as pain. João Martins Pisco, who led the study at St Louis Hospital in Lisbon, told the Daily Mail: “Within five years I think this will replace surgery as the standard treatment. Prostate artery embolisation gives men a treatment option that is less invasive than other therapies and allows them to return to their normal lives sooner. “Time and time again, I see patients who are relieved to find out about prostate artery embolisation because they are not able to tolerate medications due to their side-effects. Last year Nice approved a laser treatment for enlarged prostates to destroy excess tissue, achieving the same results as surgery but allowing men to spend a third less time in hospital. This entry was posted in Prostate, TURP and tagged BPH, BPH Treatment, GL-W, Greg Lance - Watkins, Greg_L-W, Prostate Artery Embolisation, Prostate Bead Treatment, Prostate Treatment. Bookmark the permalink. It’s really a great and useful piece of information. I am glad that you just shared this useful information with us. Please keep us up to date like this. Thanks for sharing. whoah this weblog is magnificent i really like studying your posts. Stay up the good paintings! You understand, many people are searching around for this information, you can help them greatly. having had the surgery myself I would be happy to speak with your husband’s friend if that would help. Clearly I am not medically trained so I can only speak from my experience.